Robots are really changing how things get done. Robotics is the branch of technology that deals with the design, construction, operation, and application of robots, as well as computer systems for their control, sensory feedback, and information processing. These technologies deal with automated machines that can take the place of humans in dangerous environments or manufacturing processes, or resemble humans in appearance, behavior, and/or cognition. One type of robot is in the news regularly, the drone. 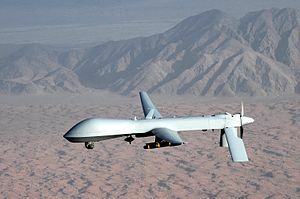 The General Atomics MQ-1 Predator is an unmanned aerial vehicle (UAV) built by General Atomics and used primarily by the United States Air Force (USAF) and Central Intelligence Agency (CIA). Initially conceived in the early 1990s for reconnaissance and forward observation roles, the Predator carries cameras and other sensors but has been modified and upgraded to carry and fire two AGM-114 Hellfire missiles or other munitions. The aircraft, in use since 1995, has seen combat over Afghanistan, Pakistan, Bosnia, Serbia, Iraq, Yemen, Libya, and Somalia.